Manufacturer of a wide range of products which include resistance decade box. We are offering Resistance Decade Box to our clients. A radically new design makes CRM the lightest available contact resistance meter. Simultaneous & multiple samples of test current and voltage drop are taken at high speed using fast & high-resolution ADCs. Resistance will be calculated by taking actual V/I ratio and averaging of individual samples giving stable & accurate results. It makes it independent of test current variations. Autoranging. Direct display of micro-ohm value does away with manual calculations. Create Device Under Test Identifi cation data (DUT Library) on PC and upload to an instrument. Save the test results in respective DUT folder in the kit. Download the same to PC in the similar folder structure. In built real time clock, memory and printer. Test time stamping on each record enables time references for future use. Fool-proof connections and repeatability are ensured by SCOPE’s specially designed proprietary Ck clamps. 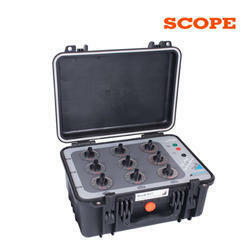 Supplied with rugged calibrated test lead set suitable for 4 wire measurement. The optimized test lead set design gives lengths enough for testing EHV CBs, yet are lightweight. Mains, as well as rechargeable Li-ion battery, operated. In built battery monitor and cut off circuit for protection against battery deep discharge. The instrument is continuously available for measurements one after the other. No ON/OFF duty cycle. Enclosed in ultra-rugged IP67 class hard molded case. PC Downloading & Analysis including ‘Trend Analysis’ possible with “CData CRM” Software supplied with kit. Instrument debug options like memory check, printer check, PC downloading check are provided.